Have you ever been in the centre of a debate regarding music on the trail? I’m not talking about someone blasting speakers and disturbing the peace, I’m talking about hiking with headphones and letting music guide your daily route. There seems to be a split between many in the community: music ruins the hike, whilst others feel it enhances it. Where do you fit into this thought process? Perhaps it’s a combination of both, all depending on the situation? 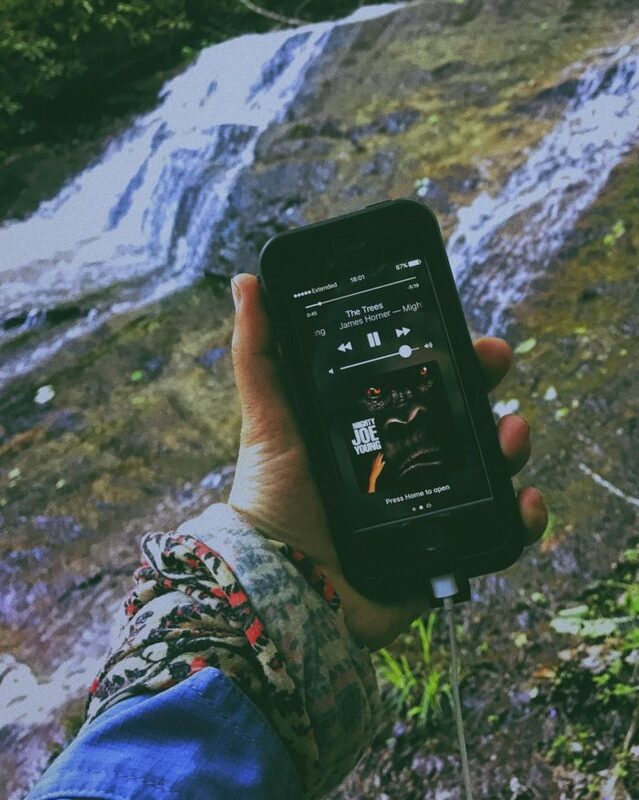 Personally, I feel music enhances my hike. I don’t listen to music the entire time, but it is on quite a lot. During my 1/3rd section hike of the Appalachian Trail, I found I was not alone in this thought. Whether it be music, podcasts, audiobooks, or even the audio of films, it seemed many other hikers went into “the zone” when they turned on their favourite tunes. My tramily and I would joke that certain songs pushed us up the mountain. My friend, Tater Tot, would have Enya on repeat when she was hiking a ridgeline, laughing hysterically at the end of the daily when she realised “Caribbean Blue” had been on repeat for hours. I started to take note of my own listening habits as I hiked; finding patterns depending on the terrain, location, weather, and my mood. What motivated me? Before I left for Amicalola Falls, I spent many hours preparing my device with all the desired audio. As a musician (Woodwinds) and singer (Opera), music is a huge part of my life; I travelled throughout Europe in 2006 with a teenage Symphony as a Clarinetist. It is an extension of who I am as a person, and having my favourite songs complimenting the landscapes makes perfect sense to me. You can imagine, I had a playlist for everything: soundtracks, alt rock, folk, Celtic, classical, musicals, soundscapes, coffeehouse, etc. a song could make or break a day’s hike. In the Smokies, I ran into some very cold, wet weather that just wouldn’t quit. I had recently torn up my knee (meniscus) and was in an immense amount of pain. To take my mind off the hot blade that seemed to be stuck under my kneecap, I decided to hone in my emotions onto the Lord of the Rings soundtrack, playing eerie songs that allowed me to shift my negative mindset. I used my injury almost as a prop, allowing my struggle to hike play into the swelling scores of Howard Shore’s music. Rain would beat down on me as I limped along the trail, “Helm’s Deep” on full blast. Within seconds, I was transported in that battle. I focused on the rocks below me, taking cautious steps as to not slip down the side of the trail. Misty mornings floated between Florence & The Machine, The Lumineers, soundtracks, Patrick Wolf, Jeremiah Tall, Emancipator, etc. Sunny afternoons had a lot of MUSE popping up on shuffle (esp. “Glorious”), as well as First Aid Kit, OneRepublic, Imagine Dragons, Milky Chance, and other upbeat tunes that would take my mind off the relentless false summits of the Southern Appalachian Mountains. I remember hiking up Blood Mountain with music that just wasn’t jiving, and subconsciously found myself at a sluggish pace. This ascent felt harder than it was… all because of my music choice. Switching over to Imagine Dragons’ “Tiptoe”, I shifted into 2nd gear within just a few seconds. Summiting to “It’s Time”, I took in the views around me. The monster I made Blood Mountain out to be ended up being one of my favourite climbs of my whole hike, and I feel that change in musical tone is what created such a triumphant finish. You best believe I’d play “The Wolf” from Into The Wild when I reached a big summit with long lasting landscapes. It. Made. The. Summit. This was the biggest factor for me. As a Naturalist, my life is focused in on the ecosystem, and I tend to immediately choose soundtracks that go along with the botany I see. Rhododendron forests called for “The Trees” from Mighty Joe Young to play on repeat, and most of the time I’d forgotten how quickly I had climbed a mountain due to the fact I was in a zone. I’d get to the summit, drenched in sweat, realising I was done for the day! 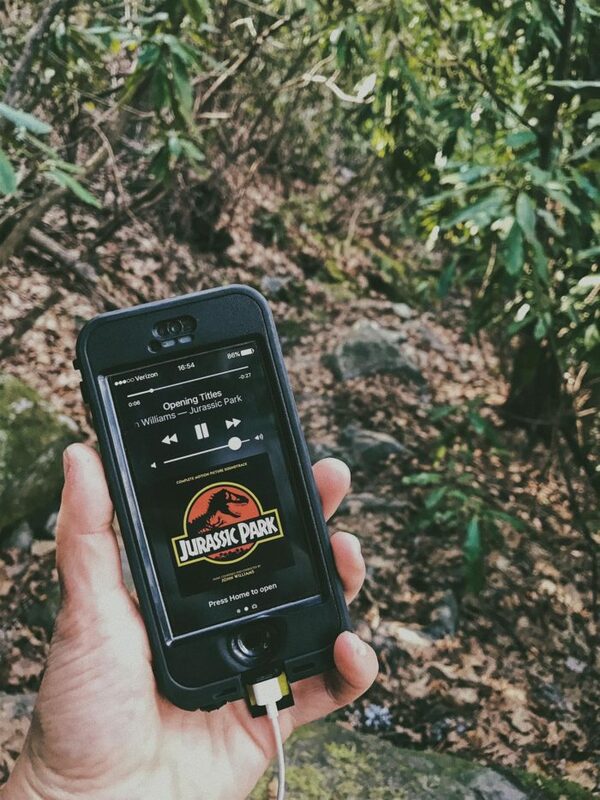 Other times, through dense trees and fern-covered forest floors, Jurassic Park would play for hours at a time, switching to specific songs depending on the twists and turns of the trail. LOST was another soundtrack that complimented those airplane crash sites and dark jungles. Vast balds – like the Roan Highlands – required certain tones, such as “Rohan” from Lord of the Rings. Alpine forests leaned towards Star Wars, Andy Laub’s As It Happens: Pacific Crest Trail, Imogen Heap’s “Canvas”, and so many more. It was amazing to see how a scene could completely change my genre in a flash! This… changed way too much. I think my mood swings flipped so violently due to my ongoing knee injury, knowing that my time on the trail was coming to an unwanted end. I would have days where I could barely straighten my leg (since my knee was swelling with fluid), I’d be popping 1000+mg of ibuprofen a day, and would take triple the time to hike compared to my non-injured self. This would kill my days, no matter how beautiful they were. The pain was getting too much, and with the pressure of friends, family, and doctors telling me to get off trail, I was making myself miserable. I can’t explain why, but Twenty One Pilots – a duo I barely listened to – became a massive support as I hiked. My pain would slowly fade as I walked along, ignoring the mountains looming in the distance. I’d focus in on the fast tempos, and somehow their music made hiking just a little bit easier. Why? I do not know, but whatever the combination is in their songs, that pushed me to get to the next town and not break down crying from the pain I was in. It doesn’t come as a surprise that my choices in music could completely turn around a bad day. I’m quite glad to know that my mind could be reset with just a different tone to help get up those hard climbs, or to make a rotten day more enjoyable. I also knew that a change in scenery was going to make me play a new song within seconds of seeing it… and you better believe I did that all too often. I didn’t think I’d enjoy listening to podcasts so much during my time on the trail, but that ended up being quite the delight on long days where the ridge just kept going and going! I also turned to heavy metal music for uphill climbs much more than I anticipated – but looking back – I should have predicted this before I ever left for the AT. Some motivational speeches I’d downloaded off YouTube ended up being huge spirit-lifters during hard days where I wanted to give up. I didn’t think I would play them so often, but now realise that those tracks got a lot of action during hard climbs where my knee kept giving out on me. No matter what your opinion is when it comes to listening to music on the trail, we all know how influential music can be on a person’s mindset. We listen to it on our daily commutes, when we hike, when we work out, when we cook or clean… it doesn’t matter. Music is soothing, it is motivational, and it is emotional. Being out in the wilderness only heightened those senses for me as I listened to my library, giving certain moments an experience that I cannot fully explain. It’s just something you’ll have to experience for yourself. How about your hikes? 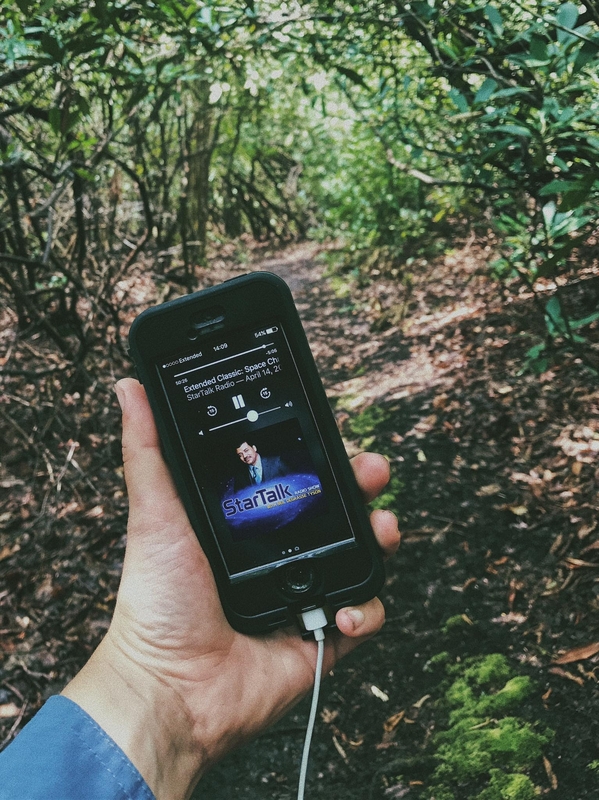 What music, podcasts, audiobooks help you on your hikes? Any stories of your own where music helped change your pace or mood during the day?